(Reuters) - Chevron Corp is slashing 10 percent of its workforce and sharply paring back its budget, with Chief Executive Officer John Watson giving a downbeat view on Friday of an industry beleaguered by low oil prices. A more than 55 percent decline in crude oil since last year has rippled through the global energy industry, forcing producers and their suppliers to make tough decisions. For Chevron, that means cutting its budget by 25 percent next year by spending less in Australia, Angola and the U.S. Gulf of Mexico, where the No. 2 U.S. oil company has major growth projects. "We need to be more efficient at what we do," Watson said on a conference call with analysts and investors. While he said prices should rise eventually, he is "sober about the current realities of lower prices" for the next few years. The news came as Chevron also reported a sharp drop in third-quarter earnings that still beat Wall Street's expectations due to cost cuts and strong refining margins. The company's pain was all the more stark given that larger rival Exxon Mobil Corp not only posted stronger-than-expected results on Friday but also had not announced any massive layoffs. Chevron plans to spend $25 billion to $28 billion next year and expects to further slash spending in 2017 and 2018, an acknowledgment that it does not expect oil prices to rebound soon. The San Ramon, California-based company also said it would lay off 6,000 to 7,000 workers. Under pressure from Wall Street, Watson committed to keeping Chevron's dividend, now at $1.07 a share. "Our first priority is to maintain the dividend and grow it as a pattern of earnings and cash flow permit," he said. The company is spending more than $20 billion on five new projects it hopes will boost production 20 percent by 2017. Two of them, the Gorgon and Wheatstone liquefied natural gas facilities in Australia, should open next year, Watson said. Such a step would help reduce construction costs and alleviate concern on Wall Street, where analysts have grown anxious about overspending. "We're going to see disproportionately strong growth through 2017, frankly into 2018," Watson said. Yet he said Chevron would "pace" the timeline for the other large LNG projects, in western Canada and Angola. In the Gulf of Mexico, the Big Foot deepwater oil project is now not expected to produce any oil at least through 2017, Watson said. Big Foot, which was slated to be online this year, had a major setback last summer with the sinking of at least nine giant tendons, designed to connect the platform to the sea floor. Chevron reported net income of $2.04 billion, or $1.09 per share, compared with $5.59 billion, or $2.95 per share, a year earlier. Analysts on average were expecting 76 cents per share, according to Thomson Reuters I/B/E/S. Production fell 1 percent to 2.5 million barrels of oil equivalent per day. Profit at the downstream unit, which is smaller than the oil-producing part of the company and which makes gasoline, lubricant and other refined products, jumped 49 percent. Refiners tend to be more profitable when oil prices are low. Chevron cut operating and administrative expenses by 7 percent during the quarter, but it was not enough to fully offset the price drop. 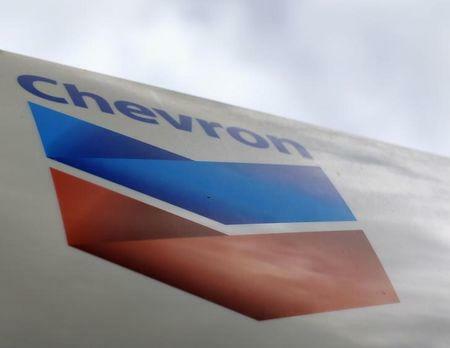 Shares of Chevron were up 1.9 percent at $91.54 in afternoon trading.